Our first upcoming trip is scheduled during the first week of December as it falls over a combination of local holidays in the UAE. One of the holidays is National Day — a two day government holiday that celebrates the unification and founding of the United Arab Emirates (this year is the 44th year as a nation) on December 2 & 3. The other is Martyrs Day, celebrated on November 30 to serve as memorial for those who have lost their lives while fighting and serving in the military. This year the two holidays were combined giving government employees a total of three days off leading up to the regular two day weekend. This will give us just enough time to explore Istanbul, Turkey for four nights. We decided upon Istanbul because it is under a five hour (direct) flight, is only one hour time difference (no jet lag), and though it is definitely off-season, the weather is still mild with no worries of snow or extreme cold that would prevent us from exploring this city that serves as a bridge between Asia and Europe. When planning this trip, we considered a few other destinations such as Sri Lanka and Cairo but ultimately we both were interested in exploring Istanbul, as its such a historic and iconic city. When we saw that the flight and hotel options were very reasonable, we pulled the trigger. Etihad offered a great direct flight out of Abu Dhabi at 9:30 am that then arrives at 12:50 IST time, and then allows us to return on Saturday night at 8:30 pm — just in time for the work week to begin on Sunday. When it came to looking at lodging in Istanbul, we lucked out with off-season rates. The weather will likely be cool and possibly rainy with averages in December falling between 40 F – 50 F. Because we are going before the busy Christmas holiday season, the hotel rates are excellent. We took advantage of Hyatt’s recent diamond challenge and were able to earn “diamond” status through our travels over the summer, so we were aiming to stay at one of Hyatt’s two Istanbul properties. 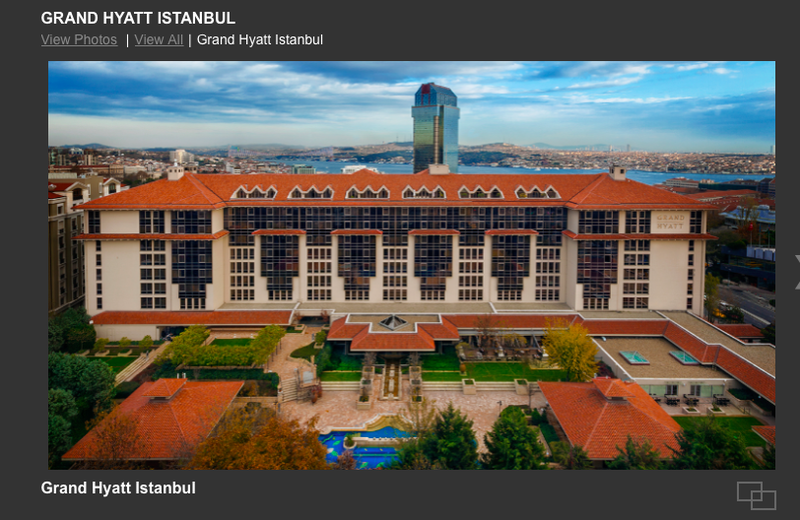 The Park Hyatt Istanbul rate is $240 per night and the Grand Hyatt Istanbul is$135 per night, leaving us an easy choice. We gladly chose the Grand Hyatt –in addition to the lower price it’s in a better location for sight seeing too as its located nearTaksim Square versus the Park Hyatt which is situated closer to high end shopping and nightlife. Due to the lower occupancy rates, we were also able to use one of our free “Diamond Suite Upgrades” for the year. Hyatt had an available suite for the four nights we will be in town, so we made the upgrade. Diamond status with Hyatt entitles us to complimentary access to the hotel’s lounge where we can enjoy free breakfast, cocktails, and snacks throughout the day. This means that for a mere $135 per night due to our Diamond status at Hyatt we will stay in a large suite with free breakfast and cocktails each day and have a late 4:00 pm checkout. Since we are paying for the stay out of pocket, we will also earn more Hyatt Gold Passport points on our stay that we will then save to use towards award nights during the busier (thusly more expensive) travel seasons on later trips. By paying now, we will be able to utilize our points and redeem them during the expensive season, which will give us more value in the long run.